Over the past 15 years, Gray's restaurants throughout Cancun and the Riviera Maya, Mexico, have made Gray obtained a reputation as a innovative chef whose cuisine is based on the styles of eclectic California cuisine, as well as education in the culinary traditions of France. Gray is in fact recognized as a pioneer in high-quality international cuisine and fine culinary concept in Cancun and the Riviera Maya, Mexico. John Gray's Restaurants offers delightful menus that respects tradition and technique, with dishes made in the classic style bistro menu and a variety of dishes of their own creation made ​​of the more unusual ingredients. 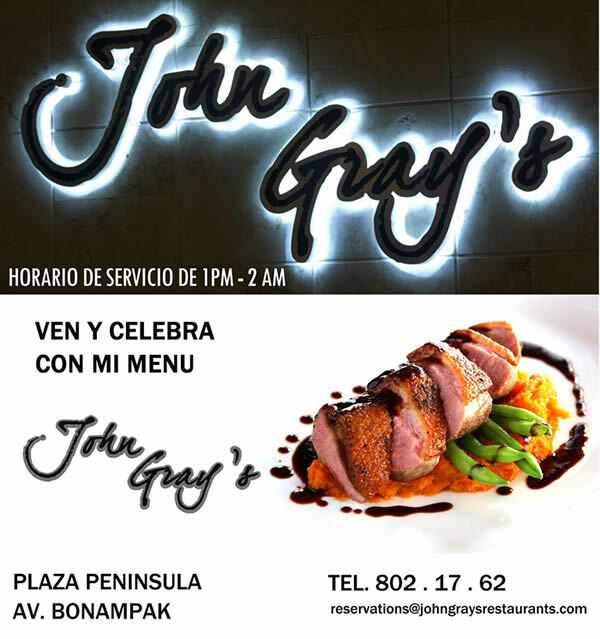 Celebrities, renowned international chefs, food lovers, politicians and locals alike have been delighted by the approach that John Gray has the ambiance, service and culinary interpretations that blend classic international flavors and ingredients that accompany each selection. In the same way that Cancun and the Riviera Maya have become destinations for discerning travelers, Gray has been able to offer its customers the highest quality cuisine while offering a diverse selection of wines from around the world.